After spending a few days at Base Camp (13,943 ft.), we were finally ready to go back up. We loaded our packs and did the darn thing. It felt a little better this time and I kept the negativity at bay. It was crazy to think this was our second time doing this, but that’s how you trek up a mountain. You go up. You go down. You go back up. Once to C1 or Plaza Canadá (16,076 ft.) we loaded our gear into the tents and made food. From this point on, our meals were Mountain House’s vacuumed packed ProPacks. They were actually pretty decent tasting, but became harder to eat as we got higher. Food just doesn’t sound good as you get closer to 22,841 ft. There was the routine of getting snow and melting it for water, hot cocoa, and to rehydrate our meals. Karl was the chef extraordinaire, and after recounting all of this, I feel lazy in comparison to all the work he did, but it was good training for Everest…I think…stupid American clients who aren’t able to convert meters into feet, lol! Below is a quick video of Base Camp. We hung out for a while in our tent, as there was a storm that had moved in with wind, snow, thunder, and lightning! It was the craziest thing to experience, and there we were, perched on the side of a mountain with no where else to go. Although a bit concerning, I really enjoyed it. It was so exciting and exhilarating. I guess I am a little crazy. Josh retreated to his tent, and Karl and I stayed in ours, and we got ready for bed. We all had a sleeping pad, a sleeping mattress, and a super warm sleeping bag. We were without pillows, but could fashion something out of clothes and gear. I wasn’t great at making a pillow that would last, so I definitely need to work on those skills so I sleep better next time. We went to bed and in the middle of the night I woke to the sound of the wind and Karl rustling around in the tent. The weather had cleared and he decided to do some nighttime photography. I was insanely jealous because I decided against taking my camera gear with me due to it adding A LOT of extra weight and Karl probably would have been the one carrying it at some point. He was already carrying a lot of my stuff already. Basically, it came down to what was necessary and my gear didn’t make the cut. I had to settle for my Canon Powershot s100, which is an upscale point-and-shoot. It shoots RAW, so at least there was that. He was gone for 30 minutes or so, and the photos I saw were amazing. This is the reason I still continue to train even though I’m not sure what it’s for at the moment. I always want to be prepared and to be able to carry my things from this point on. I can’t rely on my guide to do it. It has to be me. I’m up to 30-35lbs at the moment and it feels pretty good, but it does slow me down. That morning we woke to a few inches of snow on the ground. That meant I was switching from my hiking boots to my double plastic mountaineering boots. I was nervous about it being my first time using them, making things more difficult and/or giving me blisters. Josh and I were going up with Andy and Mariana’s group while Karl stayed back and took the tent down. We had some nasty weather moving in later that day, so the goal was to reach C2 or Nido de Cóndores (17,716 ft.) before it hit. Mariana started out leading that morning and I decided to get right behind her. She set a really great pace (we were about the same height), so it felt good to find my rhythm really quickly and focus on one step at a time. The trail had disappeared in the snow though some steeper areas were just the hard ground as the winds had blown the snow elsewhere. These sections were a bit terrifying as there wasn’t a flat surface under my feet and the plastic boots felt like they had no grip. I kept imagining myself slipping and then sliding off of the mountain. I definitely moved quickly and precisely when confronted with those sections. It was a challenging day. We had a few short breaks, but staying still too long could mean trouble. It was bitterly cold, but I was sweating, and once stopped the shivers started. I was constantly moving my toes and fingers whether we were moving or not. I didn’t want frostnip, and I definitely didn’t want frostbite. When we were in Penitentes, one of the trekkers returning from Aconcagua had frostbite. His summit push had taken way too long, something like 16+ hours, and his fingers were a dark grey, as if he had been playing with soot from a fireplace. That was a very sobering sight to see. We pushed on and Andy was now leading. Andy is a tall man, and his gait was quite a bit longer than mine. The snow got deeper and deeper because of snow drifts and trying to keep up was a battle. I was now cold, tired, and starting to feel like the mountain was winning. With the deeper snow came areas where my legs or poles would just sink in all the way. I had no resistance and having to wriggle out of those deep snow drifts with a pack on consumed a lot of energy. It was mentally taxing, too, thinking of how much farther we had to go and how long I had to battle these conditions. Could I do it? Did I have a choice? Andy led us to a more protected part of the mountain, which was counterintuitive because we weren’t going up anymore. It saved us from being so exposed and having to be hit by the bitter cold winds. As we got closer to the top, I fell behind a few people. My little legs were finished. I was ready to be done especially now that the storm had really moved in. The end was in sight, and we finally made it as we were blasted with cold and snow. I took refuge in an Inka dome to try and keep as warm as possible. I knew the cessation of movement would create a potentially dangerous situation for myself since I was so sweaty. I kept moving around, wiggling my fingers and toes, but after what seemed like 30 minutes, I was really starting to shake. The other guys were putting up their tents and how they did it is beyond me. The wind was insane and it took a handful of them to do each tent. I felt awful that I wasn’t helping, but I had no doubt that leaving the protection of the dome would put my health and possibly my life at risk if I endured more exposure to the elements. Josh and I were unable to put our tent up as Karl had not caught up yet and he had the tent. I kept my eyes out for him the entire time, but people looked like little colorful dots in a sea of snow up there. I couldn’t ever tell if it was him or not. All I knew is that I had never been so cold in my life and it reached the point where I couldn’t wait anymore. I had Josh block the door and stripped off my sweat soaked clothing and put on as much dry clothing as I could. That helped, but I was still so cold and almost to the point of tears. And then Karl arrived! I was so happy to see him, not only because it meant we could set up camp and get warm, but I was glad to see he was okay. I’m unsure of the order of events at this point, but I think Karl boiled water and we had lunch. I wrapped myself in my sleeping bag and started to feel a bit better. The boys then spent a long time setting up the tent (the three of us were now sharing one tent as the weather was too crazy to try and set up another). They battled the constant wind, and the powerful gusts for what seemed like 30-45 minutes. Josh ended up lying down in the tent to keep it stationary as Karl secured it. When they came back into the dome, I started to make trips to the tent with our gear and setting up our pads, mattresses, and sleeping bags. We then piled in and settled into bed for the night. Our tent continued to take a serious beating until the next afternoon. At times it was concerning, but again, what a thrill! To see mother nature in this way, in a tent, on a mountain, in the snow and wind…an adventure I never thought I would experience. This video shows a constant, but much weakened wind. I unknowingly suffered a bit of photokeratitis a.k.a. snow blindness that day. I previously thought snow blindness was completely losing vision for a few days, but after doing a bit of reading I found out its effects have differing degrees. I was having some trouble with my sunglasses fogging up that day, and I had to take them off to see. That ended up being an uncomfortable and somewhat painful mistake. Hours later after resting in our tent, my eyes became very sensitive to light and they burned and teared heavily when they were open. I covered my eyes until the sun went away and by the next morning I felt fine. I knew better, there is a reason I purchased level 4 sunglasses…just one of those examples of being foolish. The next day was spent hydrating, eating, talking, and listening to music. The sun eventually came out and Andy delivered some pizza he made to our tent. We were able to get out and stretch our legs for a while as well as admire the incredible view. I got to meet the famous mountain climbing guide dog and take a few photos. I was so thankful for the rest, the warmth, the sustenance, the warm water, and for the company. Liam was one of the two Inka clients that made it to the top of Aconcagua. Our Aussie friend Jimmy, the other Inka client who made it to the top of Aconcagua, brushing his teeth at C2. Up until this point, a good night’s rest was hard to come by. Some nights I was too exhausted to fight sleep, but most nights I couldn’t get comfortable or my anxiety kept me up. Leading up to Aconcagua, I had nerves. I think that’s perfectly normal, and it’s good to be fearful of such a situation. It means you have respect for the mountain and are aware of the seriousness of what you’re undertaking. However, my nerves turned into full blown panic attacks, something I’ve never experienced before. It actually manifested itself into physical pain which led me to worry even more and increase the symptoms. It was actually really scary. Fortunately, I was able to understand what was happening and took steps to quiet my worries. I meditated, I changed my diet, and I worked on letting go of some of my fear. I saw much improvement after the physical symptoms started to subside. While in base camp, I woke to the winds whipping against my tent and started to have a panic attack. It partially had to do with breathing at altitude, which can disturb sleep and cause you to wake up gasping for air, but after waking up I continued to have trouble catching my breath. I eventually calmed myself and was able to fall back to sleep. The intensity of that night only happened one other time during the trek, but the lack of sleep definitely took its toll on my body. The following morning we packed everything up and left for C3 or Plaza Cólera (19,685 ft.) We were a bit behind getting everything ready and starting our day. Andy and Mariana’s group had already left and we were trying to get all of our gear loaded onto our packs or stashed. We started out with our double plastic boots on once again. I didn’t have too much trouble with them up to C2, but I think that was partially due to walking on lots of snow and not just frozen ground. Today was different. I think we may have only been 15-20 minutes into the trek, and my right shin was in a lot of pain. With every step the tongue of the boot was digging into my shin. I tried side stepping and putting more of my weight onto my poles, but nothing I did was giving me relief. I mentioned this to Karl and we stopped to figure out a solution. We loosened the laces, pulled my sock up, tied it differently, but no success. He then took his rented mattress pad and a knife out and started cutting it up. He then stuck the piece onto my shin and tied my boot up. We started walking again, but it was still very painful. I was so angry that this is what could take me out of the game. Equipment. Not an injury, fatigue, or illness, but equipment. It was completely frustrating. We stopped again, and then Karl decided to give me his boots. I can’t remember if it was at this point that Josh switched his boots with Karl (so, Josh had my boots, Karl had Josh’s boots, and I had Karl’s boots), but that happened at some point. Karl’s boots were much heavier, but felt soooooooo much better. This is why I love these guys. The things they did to help me out will never be forgotten. Karl is a stellar guide that goes all in for his clients. He goes above and beyond with everything. He is so good at what he does. Josh is officially my adventure buddy. When I get back to Aconcagua, I know he will be right there with me, and I wouldn’t want it any other way! I want to see nothing but amazing things in their future. After all the encouragement and all they have done for me, they deserve that at the very least. After switching boots, I felt really good. I felt strong. I took the lead and got a ways past Josh and Karl at one point. It was a hard day with close to 2,000 ft. of gain. in what seemed to be a considerably shorter distance. Our last little hurdle was at the end before stepping foot onto C3 soil. It was a steep and slippery little section where there was a chain railing to help get to top. I, of course, slipped and landed on my left side and elbow. It didn’t feel good, but I was mainly terrified of slipping off of the mountain. Karl and Josh both sprang into action helping me up and grabbing my poles. I was now a bit of a muddy mess, but a little snow rub down helped in getting some of it off. A few more steps and I had arrived at C3 or Plaza Cólera (19,690 ft.) With all the set backs that day, we got into camp later than we wanted. I was exhausted physically, mentally, and emotionally. The thought of starting a very long summit day early the next morning was anxiety inducing. We got the tent set up, made food, and then went to bed. I was having major issues calming myself down, and started having a panic attack. I couldn’t catch my breath. Josh had passed out, but Karl woke up and helped me to calm down by inhaling and exhaling very slowly with me. It felt like it took a while, but I eventually fell asleep. I blinked and it was time to get up. It was 3 am, if I’m remembering correctly. That morning is still pretty foggy, so I apologize for the possible lack of information to come. We had breakfast, which was really difficult to choke down. I was spent, and wasn’t feeling great that morning. Just getting dressed and getting my gear on felt like it took energy I didn’t have. Today we wore our summit jackets (think Stay Puft Marshmallow Man, but a turquoise version). We stuffed our water bottles into the inside pockets to keep us warm, but surprisingly, it wasn’t extremely cold. Again, we were late to the party, but started making our way up and adding to the line of headlamps that dotted the mountain. It was a pretty miserable day for me, but there were a few moments that were perhaps my most favorite of the entire trip. As we started towards the trail, I looked up and saw the heavens. The clarity in which I could see the stars, the Milky Way, was breath-taking and if I had the energy to cry I would have. We started making our way up and being in the dark was messing with me. I felt so out of it. I was having trouble focusing and I was feeling more clumsy than usual. I was also having trouble finding my pace and breathing. I was moving extremely slow and kept having to stop. The altitude seemed to really be having an effect on me. We continued in the dark and watched the sun come up which was part of the other memorable moment of the day. The mountain’s shadow, a perfect triangle, pushed all the way to the horizon. A sight I had dreamed of seeing was now a reality for me. I have no idea how many hours we were into our summit push, but I came to the realization that this was not my time. We still had to get to the top, which included some difficult sections and using crampons for the first time, and then there was the whole task of getting back down. I didn’t have it that day and had to call it. For my safety, for my team’s safety, I had to call it. It was heartbreaking and I felt awful because it meant Josh and Karl would have to go down with me. There were also continuing boot issues with both of the guys feet being very cold. Some pretty nasty weather moved in later that day, after the three of us had made it back to camp. It got so bad that the Rangers closed the summit down, so even if we had continued, we never would have made it to the top. In a way that made me feel better, but I was still disappointed we didn’t get to the summit. I am, however, proud of myself for being able to make a tough decision, go with my gut feeling, and not be swayed by anything. I still believe it was the best thing to go down and do it while I could without assistance. No mountain is worth jeopardizing my health, my life, or other’s lives. It will always be there for me to try again. We were in our tent through the storm, waiting for the rest of our friends to arrive safely back at camp. 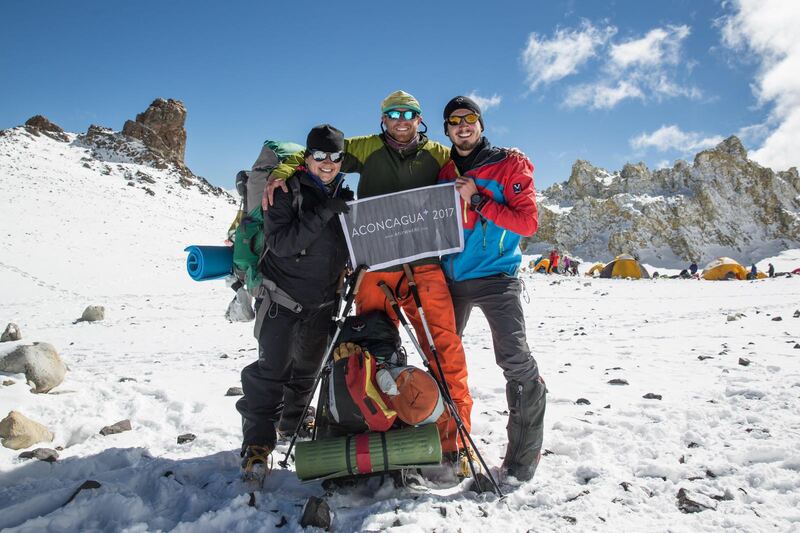 At the end of the day, everyone was safe and two Inka clients, Liam and Jimmy, and their guides, Andy and Mariana, successfully summited Aconcagua at 22, 838 ft. It was a rough go, but they did it and I was so happy for them, as well as proud. Our teams became a family, and our little three person expedition expanded to 10 people (Liz ended her bid at Base Camp after a few days, and Peru turned around at C2). These people gave me another reason why a summit would not make or break my expedition. The friendships I gained were some of the things I treasure the most. The next day, we went all the way back to Base camp (down 5,350 ft). It was another exhausting day that gave me 4 blisters, very jell-o like legs, and another nerve-wracking taste of descending down a mountain. I weathered it a bit better, and with more confidence, but it was still scary. I did get to try out my crampons for the first time, which was fun and natural feeling. No ripped pants for me! At Base Camp, we all hung out in our dining dome, then had dinner, and celebrated our adventure with some bubbly! There was music, some singing, and lots of laughter. We were not the party animals that the rest of Base Camp had been after successful summits with parties lasting well into the night, but I think our exhaustion made us all okay with that, and I think we all slept pretty well for a change! Our last morning at Base Camp had arrived, and after breakfast we were all loading our things up for the 16.5 mile trek back to the trail head. It wasn’t difficult, but it was painful. By the time we reached Confluencia, I had 6 blisters and one of them had burst open. From that point on, I looked like Quasimodo hobbling along the trail. After a while, I started going as fast as possible so I could just be done. I ended up being the second one to reach the trail head, just behind Andy, and my legs were soooooo tired. Moving after that was awkward and sore, but I made it and that was all that mattered. A little blood. Lots and lots of sweat. Some tears. I gave the mountain all of me. I pushed through all the ‘impossibilities’. I pushed when I thought I had nothing left. I didn’t stop until I felt I had to. Although I’m disappointed I didn’t make it all the way to the top, I am proud of myself for not only making it as far as I did, but for also being able to make a really difficult decision and put safety and health before everything else. The mountain is definitely still calling to me, and one day (hopefully not too far away) I will go back and finish what I started. After a few weeks of roughing it, we had a week in Mendoza to rest, enjoy some great meals, drink LOTS of wine, and have a bit of fun! 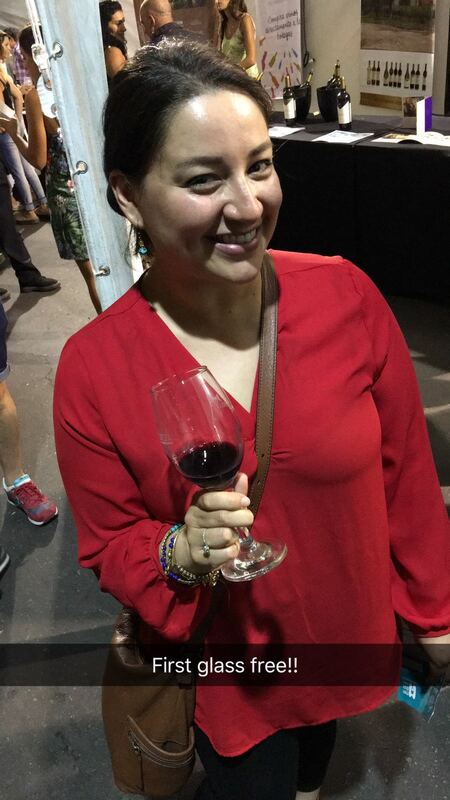 This was our favorite place to try wine in Mendoza. We were here four nights out of the week! Larry, Josh, and I with the owners, Fernanda and Marina. How things started to look after all the wine, lol! There was a wine festival going on all week. Photo courtesy Josh LaPlante.